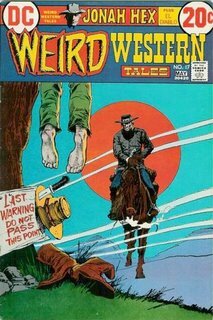 Matching Dragoons: Weird Western Tales #17 "The Hangin' Woman"
Weird Western Tales #17 "The Hangin' Woman"
Playing a little 'catch-up' and making up for being gone a week. 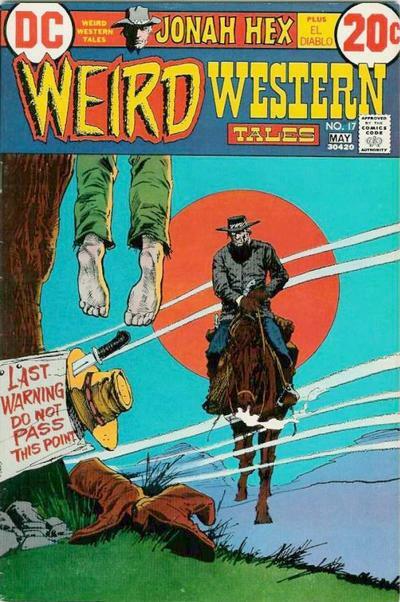 Here is Weird Western Tales #17. To say this one starts with a bang is to take the easy way out. A band of outlaws rob a bank and as they leave, they toss in some lit dynamite which explodes, killing at least 4 people inside. Then the caption text explains "Three savage desperados performing an unconscionable atrocity...and riding off without fear of being pursued and apprehended... for within some territories of the west lived men who preferred to live in fear and cowardice, thus allowing hordes of tyrannical thieves and murderers to plunder and kill whomever and whenever they chose." Man, that is what I call fancy writing. I was beginning to think that I was gonna have to find a dictionary or something. But back to the story. The local sheriff comes out to stop them, but all he gets is a lit stick of dynamite tossed his way. Now the call goes out that the bank has been robbed & the sheriff has been blown to hell & back. Jonah Hex is eating and the barkeep asks if Jonah is gonna do something about the robbery. 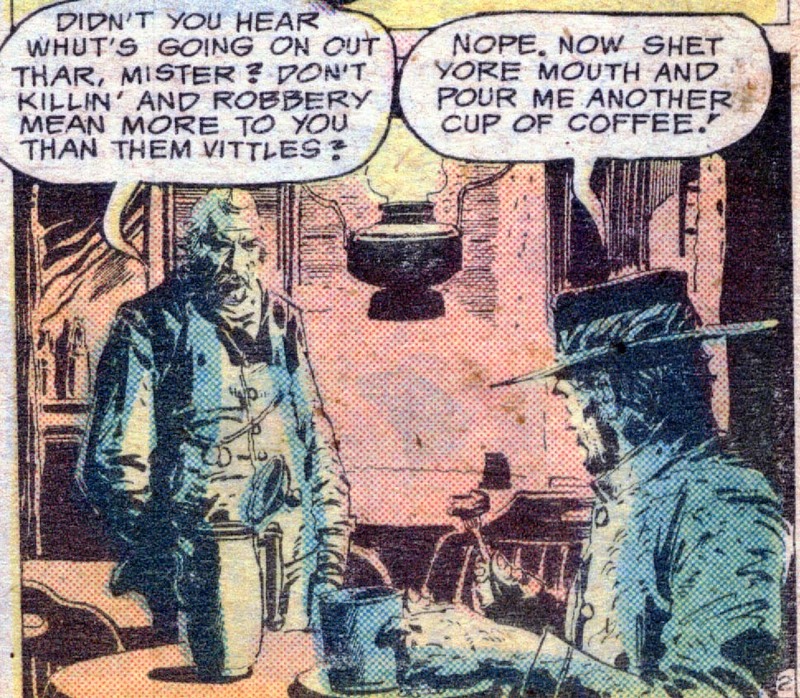 Jonah warns him to shut up & keep the coffee coming. When Jonah leaves the saloon, folks recognize him and ponder why he isn't taking any action. Some quietly voice that he is a coward. As Jonah mounts up to leave town, a young boy, Ned, approaches him and explains that he is going to be a gunfighter just like Hex. By now the townspeople have surrounded Hex and are asking why he won't help them. Jonah starts to threaten the cowardly bunch when an old woman in a wheelchair makes her way through the crowd. She apologizes for the townspeople, and asks Jonah for help since she owns most of the town and the bank is hers as well. She is responsible for seeing that the money is returned and the thieves are hanged. Jonah states that his rate is $100 each. She agrees and introduces herself as Judge Hatchet. She explains that she can probably give Jonah their route of escape & current hideout. He'll need to stop by her ranch. As she leaves, Ned explains that she's a hanging judge and that her sons are too busy burning & poisoning... An old man yells at Ned to be quiet and leave Jonah alone. Jonah gets the info from Judge Hatchet and quickly locates Dynamite Delvin & his gang. Jonah subdues the lookout and then kills the man that comes out to relieve him of guard duty. Delvin & his men hear the shooting and see somebody hiding behind a tree. They toss out some dynamite and after the explosion they discover they have blown up their own guy. 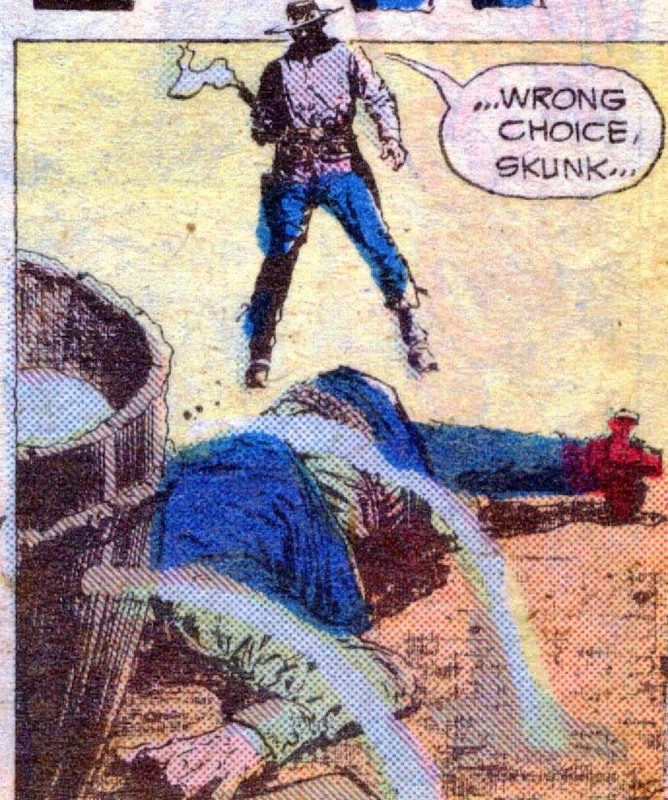 Jonah then sneaks up behind Delvin and holds a pistol to his head. Delvin shout to his remaining two men to surrender or Hex will kill him. One of the guys decides to toss out some dynamite to kill Hex & Delvin both but as he opens the door to make the throw Jonah shoots him dead. As the body falls back into the cabin, the remaining thug is horrified to watch the dynamite bounce back into the cabin and have it's fuse touch a fuse running into a crate of dynamite. The whole shooting match blows up with Jonah & Delvin barely surviving. Jonah brings Delvin back to Judge Hatchet where she quickly has her sons lynch him without a trial. Jonah returns the metal strongbox containing the bank money. Hatchet offers Jonah a job, but Jonah states that he'll only be in town two more days & then he's moving on. Two days later, as Jonah is leaving, he hears some gunfire and finds a house on fire and hears a little girl crying. Jonah rushes into the burning farmhouse and rescues the little girl. The girl keeps asking about he dad, but Jonah keeps telling her that her daddy had to go away on a long trip. As Jonah rides off to take the little girl into town to her grandparents, we see her father's corpse hanging in a tree. Back in town, Jonah drops off the girl with her grandparents. The grandpa said that he expected this to happen when his son wouldn't sell out to Judge Hatchet. She has made a business of running folks off their property and then selling everything at a high profit to folks back East. Grandpa then realizes that Ned, his grandson, will probably see the fire, find his dad, and then try to get vengeance on Judge Hatchet. Jonah heads off to find the boy. Jonah goes back to the farmhouse and sees the body still in the tree, but a rifle that had been next to the tree is gone. Jonah heads to Judge Hatchet's to find one of her sons dead, one readying a noose, and the third standing over Ned with a whip. Judge Hatchet comments that Jonah is just in time to see another hanging. Jonah asks how often her sons have been killing boys and women but the Judge warns her sons against drawing on Hex. Jonah chuckles, and turns to leave when the Hatchet boys draw. Jonah turns and fires, killing both and when Jonah tries to take Ned, Judge Hatchet pulls a pistol from under the blankets on her legs. 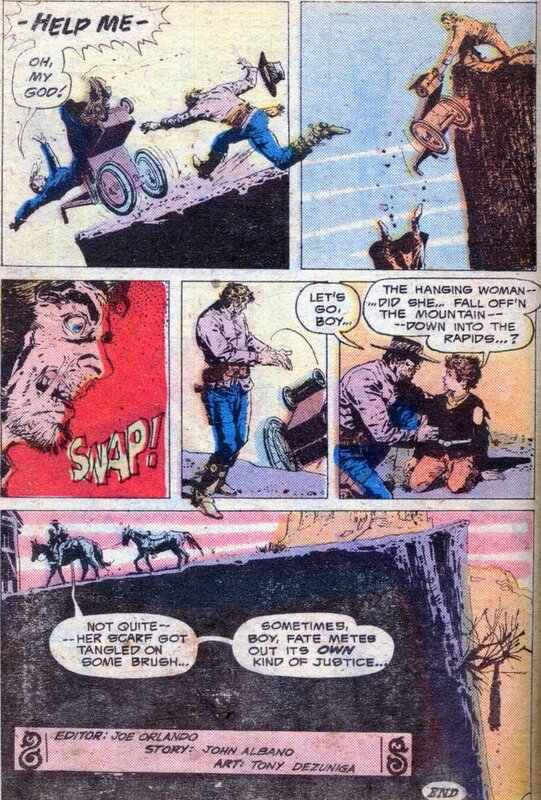 Jonah swiftly kicks the wheelchair, knocking the pistol from her hands and sending her rolling backwards to a cliff. Jonah chases after her and grabs the chair just as it dumps the judge over the edge. The final page is one of the best I have ever seen and is straight out of the EC Irony Vault. Men killed by Jonah - 4 members of the Delvin gang, Judge Hatchet & her two boys for a total of 7. Add in the hanging and explosions and the issue had at least 14 fatalities. 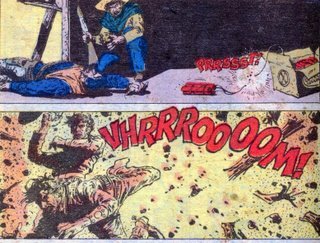 Jonah's Injuries - He was unscathed in this issue. Timeline - Jonah is wearing the black hat with the striped band, placing this around 1867. This story has several things to recommend it. DeZungia's art is great, again crossing panels. The story has two sets of villains and Jonah is wonderfully indifferent to the plight of the townspeople. He probably would have not bothered the Hatchets, but they picked on a kid and then they made it personal. 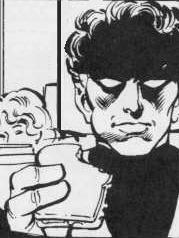 I currently only own this in a digest reprint and will have to locate it in a full size copy. Next Issue: An Indian kidnapping and .....a Werewolf?!?!?! "...Now shet yore mouth and pour me another cup of coffee!" I plan on trying this line on my wife tomorrow morning. If I haven't posted for a week or two after, then you know I'm dead. One of my favorite stories. I love that pannel that De Zuniga reproduced the poster of Peckinpah's The Wild Bunch! "By now the townspeople have surrounded Hex and are asking why he won't help them."